330 George St. Entrance is via a side entrance and through the back. There is a constant stream of people walking into the Ivy, however because there’s no cashier to collect money, there wasn’t much lining up to do. I probably waited 1 minute in line. The main building is open for free entry tonight. The Pool Club is also free, but is not reviewed tonight. I didn’t buy any drinks tonight but, according to friends, the wait for a drink downstairs was about 1 or 2 orders. The girls bathroom had about 30 people lining up! Don’t be surprised if you see random girls in the men’s bathroom. It was just the one DJ spinning the wheels tonight. Don’t know his name, but he seemed to do a pretty good job. Pretty much any crowd pleaser was played from the common genres of EDM, Pop / Top 40, while old school RnB / Old School RnB made its way into the playlist at around 1:00AM. Tracks mixed well and there were no technical hiccups during the night. A mix of young and middle-aged people. As mentioned, it is mostly suits earlier in the night but as the night progresses, these guys go home and the backpackers and “I don’t care about Friday” crowd continue on. The girls are of the same accord. It seemed like a almost fair ratio at 40% girls and 60% guys for most of the early part of the night. As the night wore on, around midnight it turned to about 25% girls and lingered at that point. Pretty much through the whole night the dance floor was completely packed. Almost like a moshpit. You can’t really move your arms. Combined with people squishing through the crowd to get to the other side, you are always being bumped into by random people. This makes for a lacklustre dancing experience. At one point I was stuck in the middle of a human traffic jam, sadly between two girls, for a good 5 minutes, as we wait for lines of people to get out of the way. I literally could not move my legs forward or backwards because of the pressure of people closing in around me. It was pretty intense for a bar. Also due to the sheer density of people in the dance floor, it becomes quite humid after 15-30 minutes of casual bobbing about on the dance floor. If you even bothered to dance, you would easily begin to sweat – – this area is not for those people who have tendencies to form armpit sweat. Since Ivy is also open air, smoking is allowed, and you will cop a lot of cigarette second-hand smoke. It is unavoidable. Upstairs at the den is a huge contrast to the main floor. It’s firstly enclosed, (and hence no cigarettes), and there’s AIR CONDITIONING. What a welcome relief. On top of this you could hold decent conversations with people here or take your partner here to hook up, which is what pretty much everybody was doing up here nearing 2AM. The group of people I was with ditched me all left at 12:30AM and so the only thing I could do was hang around like a creeper for another 2 hours before heading off myself. 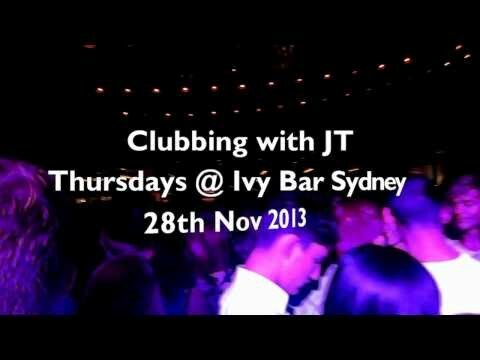 If you have a bit of money for drinks and some good tunes, I would recommend this place for a Thursday experience. Try and get some cheap predrinks somewhere else before you come in for some good times. James, Thanks for the review & information on Ivy – I know tgr Ivy Pool area but was trying to work where this space was – especially Entrance is via a side entrance and through the back. That help a lot as I was getting list looking through their website as to where to go. James, Thanks for the review & information on Ivy – I know the Ivy Pool area but was trying to work where this space was – especially Entrance is via a side entrance and through the back. That help a lot as I was getting lost looking through their website as to where to go.